Game scholar, critical aca-fan, occasional writer. First of all, I love the soundtrack to Hyper Light Drifter. Okay, I love the entire game, but the musical score stands out among the things I love about it. The 138-minute-long album was composed by Rich Vreeland (a.k.a. Disasterpeace), previously known for his work on Fez, Mini Metro and the 2014 horror film It Follows. The songs range from ambient 8-bit synth tunes to full-blown dubstep, often reminiscent of Vangelis’ phenomenal work on Ridley Scott’s Blade Runner. Like the music in that 1982 cyberpunk classic, the soundtrack to Hyper Light Drifter is woven expertly into the very fabric of the game. Every song in the score fits its context perfectly: from the heavily reverberating, sweeping chords of “The Winding Ridge” that accompany the mountainous northern section, to the quiet and tentative electronic sound of “The Abyss” that plays while you explore the eponymous area in the game. The tracks crossfade into each other depending on your location so smoothly that you can barely notice a change. It’s all just rather excellent. Then, at the end of the game, as the Drifter dies and the credits roll, we find “Panacea”, which is six minutes and four seconds of absolutely beautiful, melancholic, gutwrenching piano music. The piece is the very opposite of the rest of the sountrack in terms of sound: instead of synthesizers and drum machines, we hear a grand piano–or rather, a room in which someone is playing a grand piano. We hear the subtle thuds of the keys being pressed, the notes echo softly through the open space, and we can even hear the pianist himself move and breathe at one point. 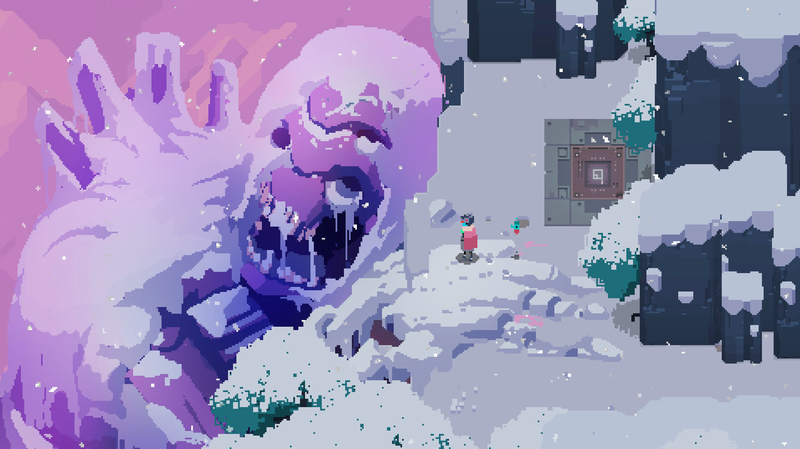 This makes the piece feel very grounded and intimate, which is exactly what you need after you’ve just defeated the last boss and then helplessly watched the dying Drifter slump against a rock. “Panacea” does its name justice as a musical cure for the emotional wounds we’ve suffered at the hands of the game. Like I said, this track’s intimate, personal sound contrasts heavily with the unfamiliar, otherworldly atmosphere that the rest of the soundtrack produces. Pieces like “The Midnight Wood” and “The Gaunlet” are eerie and give the player a sense of looming threat as they roam the world. Tracks such as “The Last General” and “The Sentients”, which play during boss battles, are overwhelming and full of urgency, bringing the hidden threats to the fore and confronting them directly. Lastly, “Chimera”, the piece that accompanies the game’s final boss fight, is loaded with lethal tension and existential dread. Heavy distortion and a nerve-racking drum beat fill the player with paralysing fear, making this last battle the most terrifying of all. The remnants of creatures and dangers long past still haunt the world, reminding you that you’re never safe. 1. Hyper Light Drifter was intended to be a game that terminal heart disease patients, like its lead developer Alx Preston, could identify with. For more on that, see this short VICE documentary. You’ve traversed sky-high mountains and dense forests, killed hordes of villainous creatures, and bested great monsters to get to this point. It was a rough journey full of many defeats and few victories. Now, you enter the Abyss to confront it, your final challenge. As the demonic being rises before you, you tremble with fear and excitement. Despite the arduous and difficult battle, you eventually overcome the being’s terrific power and strike the killing blow. A sense of triumph–but then you suffer a horrible coughing fit, worse than any of the ones you had before. The Abyss, the entire universe starts to crumble around you. Triumph is replaced with confusion and fear and disbelief: you thought you beat this! The mysterious black dog that’s been following you around this entire time appears in the doorway and calmly signals for you to come. You chase it through a disintegrating world, surrounded by darkness, with only the road before you illuminated. You arrive at a strangely familiar-looking scene: a forest clearing with a great dog-like stone statue and a burning campfire. As the world ends and a certain peace envelops you, you lean against the statue, and you die, basking in the light and warmth of the fire. The dog watches from above as rocks and trees come tumbling down and the image fades into bright pink and then black. As wordlessly poetic as death can be. This is the ending to Hyper Light Drifter (2016), an action role-playing game about… well, it’s not entirely clear what it’s about. The game itself gives clues, but refuses to explain itself to you: the story is told solely in images, not in words. If my description of its final moments were confusing or vague that’s entirely the point, because the entire game is like that. While playing Hyper Light Drifter, you’re never completely sure about what is going on, or why you’re fighting all of these monsters, or why you die when it’s all over. The only certainties you really have are the things you’re doing and the things you’re feeling while doing the things you’re doing. One of the things you’re inevitably doing is dying, and probably a lot of it. In Hyper Light Drifter, death as a ‘fail state’, i.e. as a consequence of player failure, seems at first to be the standard ‘trial-and-error’ type of death. After all, you die, you respawn, and you try again. In addition, the game implicitly encourages normalisation–which I’ll explain in a bit. However, I would argue that death has another purpose in this game: it is also meaningful death. Purposeful deaths–or rather, ‘meaningful deaths’–are “death scenes that attempt to contribute something to the general narrative tone. There may be no explanation for how the protagonist returns from death, but the death itself invites a moment of spectatorship”. Examples of this are the gruesome death scenes in survival and horror games such as Tomb Raider (2013) or Resident Evil 4, which emphasise the harsh conditions and terrible dangers that their protagonists face. Like I said, in Hyper Light Drifter, death as a fail state occurs a lot, which is because it is not a particularly easy game. The combat mechanics by themselves are simple enough, but the enemies in the world are comparatively tough and often come in large groups, forcing you to think fast and to constantly evade attacks from all angles. At the normal difficulty setting, five hits or less means death: time slows down and stops as your character loses their life, and the screen fades from a deep purple into black. Health packs can be found throughout the world, but they are rare, so you’ll often have to face a room full of enemies with less health than you’d like. The game’s treacherous level design also increases the difficulty of combat, because you need to always be acutely aware of anything and everything that is occurring on the battlefield. What you feel as you die over and over again is rather predictable: frustration, disbelief, anger. Some will feel discouraged and quit playing, others will be strengthened in their determination to beat the game and keep going. Then, when you overcome a particularly difficult area or finally defeat a boss, you feel relieved and triumphant. However, the game itself only modestly celebrates your victories: the Drifter smashes their sword into the ground and then simply goes on as if nothing awesome just happened. There is constantly a contrast between crushing defeat and understated victory, between spectacular death and unremarkable survival. It’s as if the game is telling you, “Yes, hooray, you just defeated that boss, but don’t get cocky because you’ll definitely die some more soon”. The harshness and spectacle with which player death is presented, combined with this lack of celebration, contributes to a general sense of being under threat that pervades the entire game. Playing as the tiny and fragile Drifter, you move through the world high-strung, fully aware that dangers are ever-present, multiform and manifold. This is, of course, exactly the point. If the Drifter was able to just stroll merrily through rooms full of enemies and never met these numerous and horrific ends, the player would feel far more powerful than the game wants them to feel. Death in Hyper Light Drifter serves to create a very specific, threatening atmosphere. It helps to give the player a constant sense of impending doom. The game’s final death scene, then, is the culmination of that effort: the Drifter confronts the being that has been haunting them since the beginning of the game and even manages to kill it. For a brief moment, the image focusses on the Drifter, slashing their opponent and dealing the final blow. For a brief moment, survival becomes potentially spectacular. For a brief moment, you might expect the game to finally congratulate you on your victory. And you know what happens next. The roles have suddenly been reversed. For just a little while, life seems spectacular and thunderous and celebratory because you defeated the evil! Then, the spectacle is interrupted and death comes to signify the understated and the unremarkable. Hyper Light Drifter won’t give you a victory, but it will give you one of the most impactful video game endings I have ever played. It’s bittersweet, simultaneously cynical and beautiful. That whole journey, for naught but a quiet death near a campfire. 1. Rolf Nohr, “Restart after Death: ‘Self-optimizing’, ‘Normalism’ and ‘Re-entry’ in Computer Games.” In The Game Culture Reader, eds. Jason C. Thompson and Marc A. Ouellette (Newcastle: Cambridge Scholar Publishing, 2012): 82-83. 2. A more in-depth exploration on the absence of tragedy in video games can be found here.